It will be Remembrance Day next Monday, so we are going to look at the name of another First World War hero. Hugo Vivian Hope Throssell was from the country town of Northam in Western Australian, the son of former Western Australian premier George Throssell, who had also been Mayor of Northam, and the town’s first official citizen. George was prominent in local business and conservative politics, and was known as “the Lion of Northam”. Hugo was sent to an elite boy’s boarding school in Adelaide, where he was captain of the football team, and a champion athlete and boxer. After leaving school, Hugo became a jackaroo on cattle stations in the north, then he and his older brother Frank Erick Cottrell (“Ric”) bought a farm together in the wheat belt. The brothers had a close bond, and were later described as “David and Jonathan” in their devotion to each other. When war broke out in 1914, Hugo and Ric joined the 10th Light Horse Regiment, and Hugo was commissioned as a second lieutenant. Hugo arrived at Gallipoli in August 1915, just before the assault on the Nek, which he called “that FOOL charge”. Within minutes, 9 officers and 73 men from his regiment were killed. Hugo was eager to avenge the 10th Light Horse, and on August 29, the regiment were brought into action to take a trench full of Turkish troops near the summit of Hill 60. The surrounds became a slaughterhouse, with the bodies of the dead piling up so quickly there was no time to bury them. A fierce bomb fight began, described by Hugo as a sort of gruesome tennis match – it was one of the most intensive bomb fights of the Australians at Gallipoli. During the night, more than 3000 bombs were thrown, with the Western Australians picking up bombs thrown at them and hurling them back. At one point, Hugo was in sole command of the regiment, and was wounded twice, continuing to yell encouragement to the men with his face covered in blood. 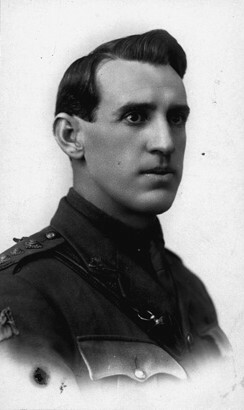 For his bravery and inspirational leadership, Hugo received the Victoria Cross; it was the first VC a Western Australian had won during the war. Promoted to captain, Hugo joined his regiment in Egypt, where he was wounded in April 1917 at the second battle of Gaza. It was here that his brother was killed; the night Ric disappeared, Hugo crawled across the battlefield under enemy fire, searching in vain for his brother amongst the dead and dying, whistling for him with the signal they had used since they were boys. Hugo took part in the final offensives in Palestine, and led the 10th Light Horse guard of honour at the fall of Jerusalem. Soon after the war’s end, Hugo married an idealistic young Australian writer named Katherine Susannah Prichard, who he had met while in London for medical treatment, and settled on a farm near Perth. Already an award-winning novelist when she married Hugo, Katherine’s career continued to flourish. In 1920, Katherine became a founding member of the Communist Party of Australia, with Hugo joining her as a speaker to support the unemployed and striking workers. Hugo’s experience of war had made him a pacifist and a socialist, but his views on the futility of war outraged many, especially coming from a war hero, and the son of a conservative political figure. His political opinions damaged his chances of employment during the Depression, and he fell into serious debt. At one point he pawned his VC just so he could take his son to the movies. Believing that he could provide better for his family if he left them a war service pension, he shot himself in 1933, and was buried with full military honours. His wife, who had been on tour in the former Soviet Union at the time, suffered another unbearable anguish on top of losing her husband. She would never know if Hugo had read the manuscript of her unfinished novel, Intimate Strangers, in which an unwanted husband kills himself (Katherine changed the ending to the novel before publication). Friends blamed Hugo’s depression on an attack of meningitis he had suffered in the trenches of Gallipoli which almost killed him. Depression and disordered thinking can be an after-effect of meningitis, and Hugo had undoubtedly been under severe post-traumatic stress since his arrival at Gallipoli. The tragedy of his war was that it damaged him psychologically to the point where he felt he could not continue. In 1954 a memorial was built to Hugo outside his home, and a ward at Hollywood Private Hospital in Perth is named after him. In 1983 his son Ric Throssell gave his Victoria Cross to the People for Nuclear Disarmament. The Returned Servicemen’s League bought the medal and presented it to the Australian War Memorial in Canberra, where it is on display in the Hall of Valour. Hugo is the Latinised form of the Germanic name Hugh, meaning “mind, heart, spirit”, which was introduced to Britain by the Normans. In medieval times, the name Hugo would have been commonly used in Latin documents, but the person would have been called Hugh in everyday life. Another famous Australian with this name is actor Hugo Weaving, who has been in several Hollywood blockbusters, as well as many Australian films. The name Hugo has been in the charts since the 1970s, and began ranking in the 1980s at #421 – the same decade that Hugo Weaving’s screen career began, in the 1984 cricketing miniseries Bodyline. During the 1990s, when Hugo Weaving gained international attention for Priscilla, Queen of the Desert, Hugo was #248, and by the early 2000s, when Hugo Weaving was starring in The Matrix series as Agent Smith, and The Lord of the Rings as Elrond, it was #143. In the mid to late 2000s, when Hugo Weaving was providing the voice of the villainous Megatron in The Transformers, it had risen to #117. The name Hugo made the NSW Top 100 in 2009, debuting at #93, and last year was one of the biggest risers for boys nationally, going up eleven places. Currently it is #76 nationally, #67 in New South Wales, #79 in Victoria, #83 in Queensland, #79 in Tasmania, and #76 in the Australian Capital Territory. Hugo went up 10 places in Victoria and 23 places in New South Wales, so it is making significant gains. Based on its current trajectory of popularity, I have picked it to be a Top Ten name by 2028. Hugo is more popular here than in either the US or the UK, where it is not yet in the Top 100. However, it is extremely popular in Europe, and is a Top Ten name in France, Spain and Sweden, so we are following the lead of European countries rather than English-speaking ones. This is a handsome name with a touch of European sophistication, and a fashionable OOH sound as well as a trendy O ending. It doesn’t really surprise me that Hugo is rising through the rankings while steady classic Hugh continues to plod along in the mid-100s, where it’s been since the 1980s. Hugo is more stylish and fits in better with current trends. If you love the name Hugo, you certainly won’t be alone! POLL RESULT: Hugo received an approval rating of 80%, making it one of the most well-liked names of the year. People saw the name Hugo as handsome or attractive (27%), stylish and sophisticated (19%), hip and cool (15%), and cute and quirky (15%). However, 8% preferred classic Hugh, and 5% gloomily prognosticated that Hugo would soon be too popular. Only one person thought it was already too popular.